Arnhemland in Australia's remote Northern Territory is home to over 10,000 Aborigines. It's one of the only places I've visited that requires special permits to enter, and on doing so you quickly become aware you are visiting a sacred place for Aborigines. The journey there was long, hot and dusty. A red cloud of dirt followed our 4WD as we kicked down the bumpy tracks and roads. To the side of the road was outback, scraggy plants and the odd bit of broken and rusty wire fence. 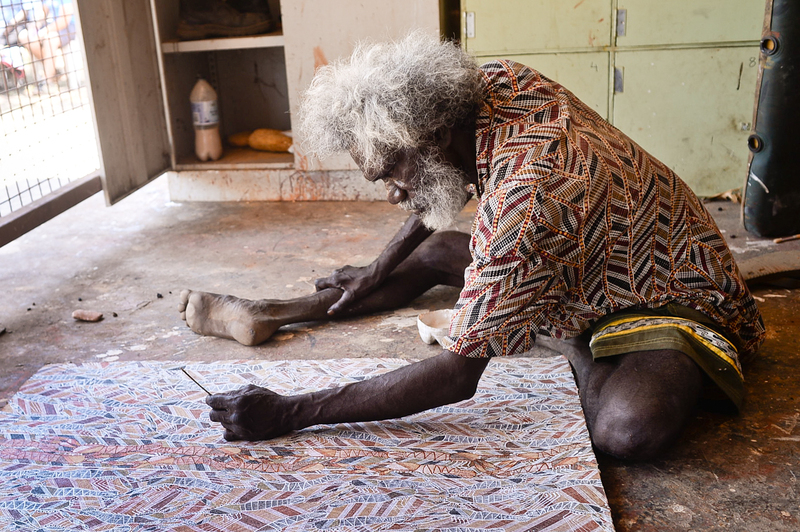 We had come to visit an artists workshop, and then some ancient Aborigine rock art in the hills above. The artists studio was empty. Rather than sit inside using tables a couple of Aborigines sat cross legged outside on the concrete, with scruffy bits of canvas lying in front of them on the ground. They were absorbed in what they were doing, and gave us little eye contact. A commercially minded artist would have showed us work, they were just quietly translating their spirit world onto paper. We left them to it. From here we drove towards the base of a set of rounded red hills. On the way we stopped to pick up our Aborigine guide from the roadside. He was slim, with wild grey hair, distinctive Aborgine face and dusty old clothes. He smiled at us briefly, then sat facing away from us and looking out of the car window at the passing landscape. Our driver dropped him and us at the bottom of the trail. Normally at this point in any guided walk you get a little introductory chat - how far it is, what to look out for, letting you know your guide will answer any questions etc. Our fella said nothing, just set off slowly up the trail. We followed. It was very hot, and after about 10 minutes he stopped on a wide ledge with fabulous views over the flatlands below. He started to study it very intently. By now we had a thousand questions. What was the name of the hill? What beliefs do they have about it? How much further would we walk? How much rock art is there? How old is it? With every passing minute another question occurred to us. He just stood there very still and looked even harder at the view below. A few seconds silence in the company of someone you don't know feels a little odd. A few minutes starts to quickly feel uncomfortable. The temptation to fill it with a few words, any words, becomes very strong. However, his obvious and total absorption in the view and landscape prohibited this. By now we had spent more than 30 minutes with our guide, without him saying a single word. We went through a phase of thinking something was badly wrong, but this slowly passed and we just stood there, and our gaze followed his. We started to forget about the heat, the dusty journey, all our questions and just were there, with him and his ancestors in their special place. We calmed. We started to feel the place. He then turned to us, gave us a huge smile and with a sing song voice started to introduce his culture and this place to us. We saw poetically drawn animals, hunting scenes, birds, children hand prints and stories perfectly preserved in and across the rock. Swirls of history and spirit world's covered the boulders like flames. Our guide never stopped explaining and talking, at times acting out various events illustrated on the rocks or from past lives. Later, I came to realise it was one of the most skilful and confident pieces of guiding I'd ever experienced. Visiting this place was like visiting the soul of his people, in the silence on that ledge he had helped us decompress and move from our world to his.